William and Kate stepped out for the first time post-Honeymoon in their official public appearance for a charity event last night in London. Yet all we could think about was, "haven't we seen this gown somewhere before?" 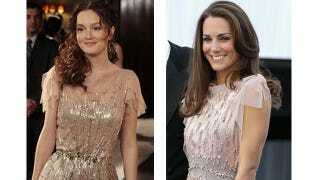 As it turns out the dress, by designer Jenny Packham, is nearly identical one that Blair wore in Gossip Girl's 4th season finale. Perhaps most ironic is how Blair's storyline at the time involved her falling in love with a French Prince named Louis, whose mother was vehemently against his engagement to a commoner. Ahem.